Though meant as a spoof of a high fantasy novel, the main theme of it is actually the family relationship between Wizard Derk, his wife Mara, and their children -- both human and griffin. Derk's special talent is the ability to make things grow, things being both plant and animal. He has many experimental animals in the yard--horses with wings, invisible cats (that might not be in the yard anymore), flying pigs and more--but only one of his creations was given human DNA and those are the griffins. When the world is threatened by a ruthless man from a parallel universe and his "Pilgrim Parties" into the realm, the entire family will have to come together to make things right. And they're not perfect--sometimes far from it--but even in the darkest times they can count on each other. Share your Dark Lord of Derkholm and Year of the Griffin love today! These might be my very favourite DWJ books of all. I love the griffins, love the family relationships, love the flying horses, LOVE Derk (and his remarkably long-suffering wife!). The writing is suffused with layers of humour all the way through, the satire is biting, and yet the story is far more than just a spoof. Every character is fully developed and has his/her own character arc. Quite remarkable writing. These are definitely contenders for my favorites too. Whenever I think of a perfect comfort read, these two always come to mind! 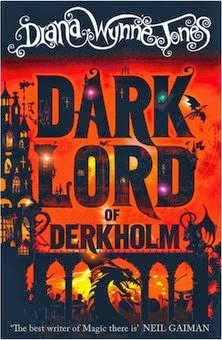 I need to reread The Dark Lord of Derkholm! I've read Year of the Griffin nearly to death, but I don't reread the first one nearly as often. The time is now!